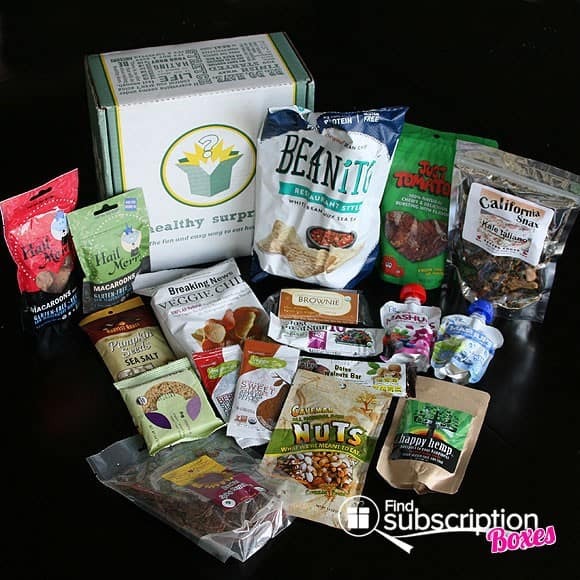 Food and snack subscription boxes are one of our most popular categories of subscription boxes. 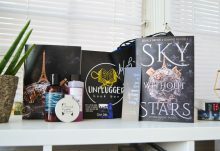 They’re also one of my favorite types of subscription boxes because, well, I like to eat! 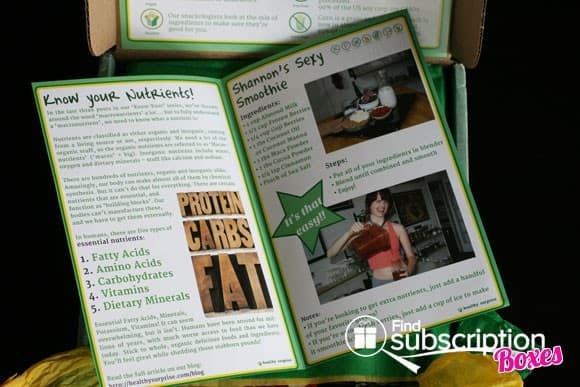 Today we’re taking a closer look at the Healthy Surprise snack subscription box. 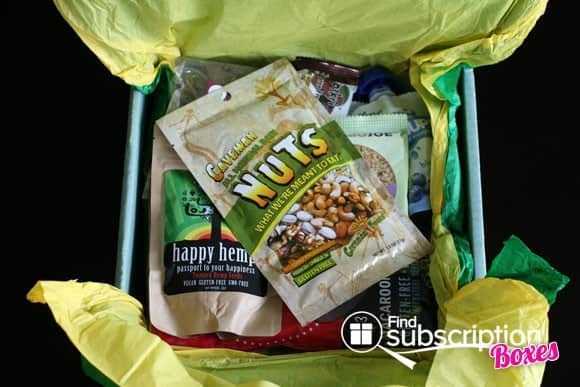 Every month, Healthy Surprise sends its subscribers curated boxes of full size snacks that are natural, vegan, gluten-free and soy-free. They offer three different box sizes that can feed anywhere from 1-2 people or 2-6 people, which is a great option for larger families. 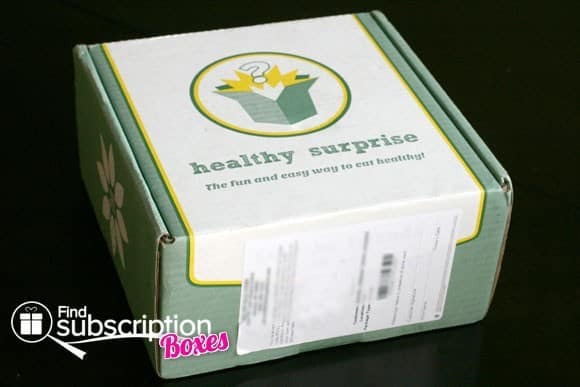 The Healthy Surprise box is a sturdy cardboard box, which is a good thing because this box is packed with food. Upon opening the box, we found a welcome card on the lid of the box, describing the food that is (and isn’t) in the box. There was also little booklet that had information about nutrients and shared a healthy smoothie recipe. After removing everything from the first layer of tissue paper, it was time to see what was underneath, in the second layer. This is what the entire contents of our Health Surprise looks like. There were a total of 18 different items in the box. Let’s take a closer look at each tasty morsel inside our box. Using only pure Sea Salt, these were a delicious way to enjoy pumpkin seeds. There was a great salty flavor without being over salted.! The Caveman Raw Nuts were simply quality nuts in their purest form – raw. There was a nice variety of nuts – from pistachios to macadamia to cashews and more. I’ve never eaten hemp seeds before. They have an herbal flavor and are full of omegas, essential fatty acids and minerals and vitamins. This is a tasty way to help get your veggies and fruits. Great for snacks. Even with no sugar added, the kids will love these. Plum Kids Organic Mashups are an easy way to bring your fruits and veggies with you on the go. 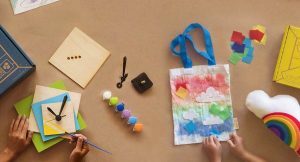 They come in individual pouches that are kid-friendly and easy to enjoy for snacking anytime, anywhere. With hints of strawberries and vanilla, these macaroons are dehydrated at low temps and melt-in-your mouth at room temperature. These raw macaroons are made with organic expeller pressed coconut oil and are made with the purest ingredients. With coconut, walnuts, and fig, this bar is packed with flavor and health benefits. This organic brownie is the favorite brownie for Gopal’s customers. Coconut, walnuts, dates, and carob powder combine to make this tasty treat. Made with only natural non-GMO ingredients, Beanito chips can hang with the best of them, but are also packed with fiber and protein. Get a burst of tomato flavor with every bite of Just Tomatoes Just Tomatoes. These perfectly dehydrated tomatoes have a hint of chew and can be used to add flavor to recipes. These chips were gobbled down so quickly, that I didn’t even have a chance to try them. The people who did eat them told me they were surprisingly delicious. The speed with which they were eaten supports that comment. We weren’t able to find these for sale online yet, so keep your eye out when you visitor your local organic or natural foods store. These Antioxidant and organic bars use cacao nibs to add a surprise crunch and dark chocolate flavor. Whether for breakfast or an on-the-go snack, Oskri Dates Walnuts bars are also Kosher. 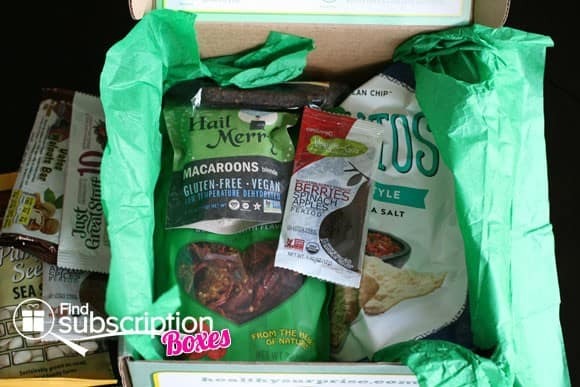 We loved that so many different healthy snacks were included in a single Healthy Surprise box. 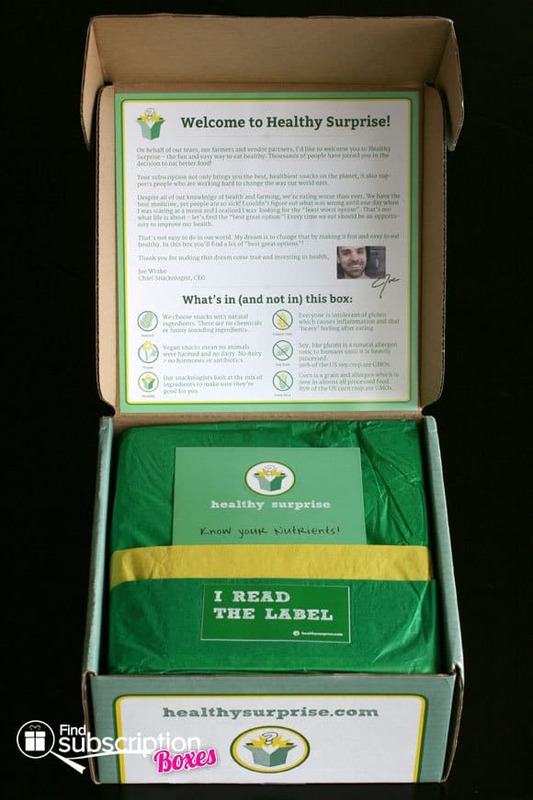 It was great seeing products from both smaller and more “name brand” healthy food companies. This box had a estimated total box value of $44.07.